Do you want to learn Spanish and travel at the same time? At Peach Traveling School you will get completely immersed in the Spanish language and culture by visiting several cities of the beautiful southern region of Spain (Andalusia). This programme is suitable for people with a “traveler” spirit, who want to learn Spanish in a different way than within the four walls of a traditional school. You will learn Spanish while traveling by a private bus trough Andalusia. Each day you will enjoy authentic and local experiences. You will for example visit the most beautiful cities and charming traditional villages, discover unique treasures of nature, meet extraordinary people, taste and learn about the local natural products and gastronomy, and all while practicing your Spanish! Depending on the duration of your prorgamme, you will visit the following cities or villages: Málaga, Ronda, Cádiz, Vejer de la Frontera, Tarifa, Jerez de la Frontera, Sevilla, Antequera, Granada, Trevélez (Alpujarras) and Nerja. Through the fun activities you will improve your Spanish even more and live the authentic Andalusian life! During the 1- or 2-week trip trough Andalusia, you will be accompanied 24/7 by a professional and experienced Spanish Teacher, who will impart 20 classes of Spanish per week (3 per day in 5 days). The 15 ´official´ lessons per week, will focus on all 4 skills: reading, writing, listening and speaking. Furthermore, throughout the entire tour you will practice Spanish many more hours in addition to the official 15 lessons, as the teacher will be your guide and all activities and excursions will become practical Spanish lessons. You will listen to cultural lectures and explanations about the sites that you are going to visit, which makes it an interesting and memorable way to learn Spanish. The teaching method is developed for A2/B1 level (Elementary/ Intermediate). Those with a higher level can also participate, as they will have the opportunity to do extra exercises and assignments outside the official classes, adapted to their level. Students with a lower level than A2 are advised to take a regular language course in advance at one of our other partner schools in Malaga. 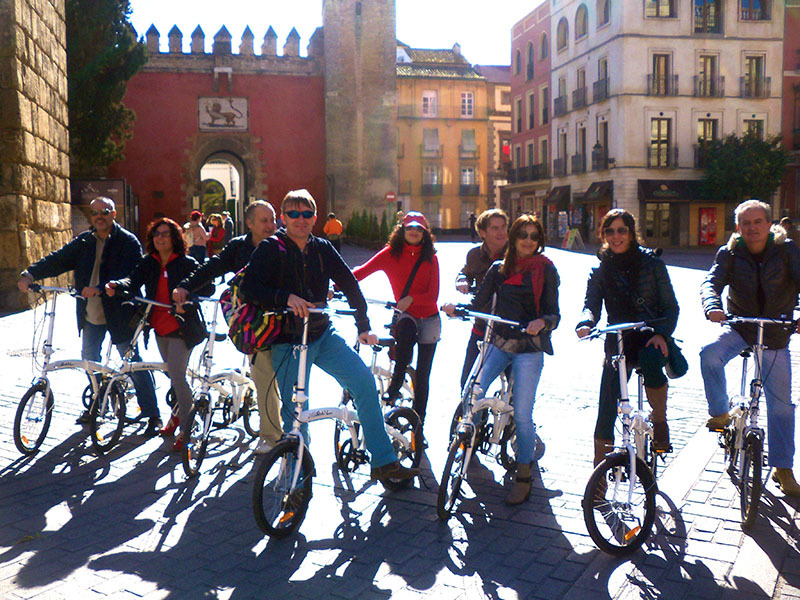 Depending on the duration of the programme you choose, you will begin the journey in Malaga or Seville. End of the journey is always Malaga. For the exact overview of the trip specified by day, please contact us. If you want to extend your stay or combine your trip with a standard language course in one of our other partner schools in Malaga or another city in Southern Spain, this is also possible. For more information contact us. Starting dates depend on the duration of the programme (1 or 2 weeks). The loaction of arrival and departure of the travelling classroom programme is Málaga. If you choose to join the 1 week programme you will join on the second week of the 2 week programme. The programme is suitable for students with A1-B2 level of Spanish. We recommend students with A1 level to book an intensive course of 1 or 2 weeks prior to the traveling programme, to have at least basic knowledge of Spanish. It’s possible to book extra activities during the prorgamme against a supplement of € 75. You can choose from: Mountain biking, horse riding, Kite-surfing, Paddle Surf of Yoga. Accommodation is mostly in a hotel (3-4 stars), but at the beginning and end of your stay you will also spend a night in a host family. For more information about the accommodation per night of the programme, please contact us. The price for an airport transfer mentioned above is per person and per way, on arrival or departure at Málaga Airport (AGP). The programme is open from March until the end of October. Starting dates depend on the duration of the programme (1 or 2 weeks). Even though most accommodation will be arranged in a hotel or ‘finca’, some nights of the programme you will stay with a Spanish host family. Staying with a family enables you to have a look inside the Andalusian culture. When you book the 2-week programme, both in the beginning and at the end of the trip you will be accommodated at a host family in Málaga. In case of the 1-week programme, you will start the trip in Seville, meaning you will stay the first nights in hotels and only the last night of the prorgamme in a host family in Málaga. You will stay in a single or double room based on half board.